This is a quick guided tour through HiView. We suggest to do what is described in each step, below, in the order presented for an introduction to the basic HiView operations and capabilities. The User’s Guide Reference offers complete descriptions of the various other ways of doing the operations and to learn more about the capabilities of the tools. 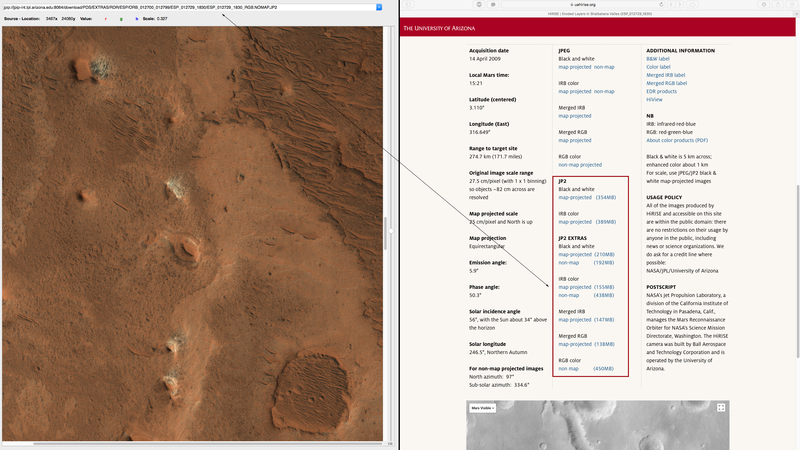 Open a HiRISE image by first selecting any image of interest on the HiRISE website. Under the JP2 Quicklook Download heading, next to the RGB color label, click and drag the underlined link onto the HiView Display Viewport. The JPEG2000 image will then load, depending on the speed of your Internet connection. The Source Location field will show the JPIP URL for the source image data. Change the image scale by dragging the thumb on the scale slider to the right of the Display Viewport. Or, select View>Navigator from the menu bar and set the scaling factor to 0.5 by entering this value into the image scale field of the Navigator Image Details panel Geometry section. Scroll the Display Viewport to a new location by dragging the thumb on the horizontal scroll bar below the viewport and the vertical scroll bar to the right of the Viewport. In the Navigator Image Details panel Geometry section, set the Region Origin field values to 940 X and 16715 Y. Select View>Statistics from the menu bar. Close the Navigator Tool by clicking the X button in the upper right corner of the tool’s panel. Now, apply a default contrast stretch by selecting Default Contrast Stretch in the Data Map menu. 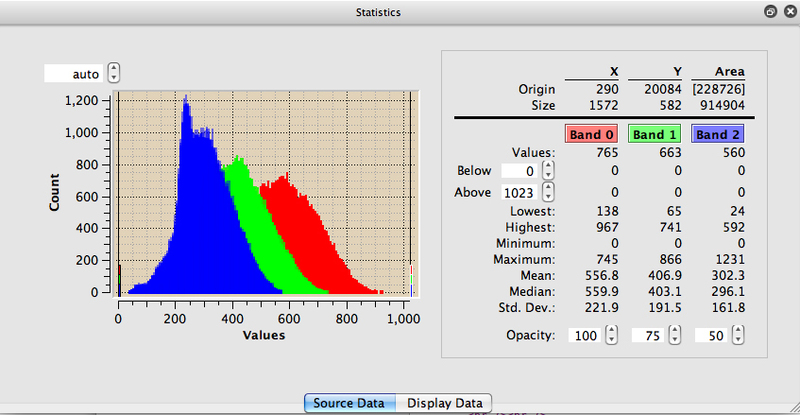 Select View>Data Mapper from the menu bar. Drag the thumb of the slider in the Saturation Bounds Histogram Percents Lower section up a little (Settings field values of about 10 should be fine) to significantly increase the image contrast. Close the Data Mapper and Statistics tools by deselecting them from the View menu. After you quit HiView, the next time you run the program, HiView will restore its last window position and size, and open the last image being viewed unless the settings for these features are changed in Preferences>General Layout.